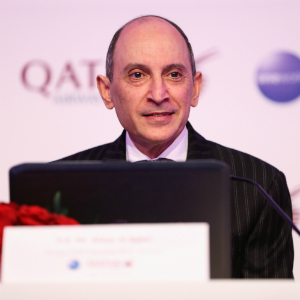 Qatar Airways Group chief executive, His Excellency Akbar Al Baker, unveiled the airline’s aggressive expansion plans and 16 new destinations for 2018-2019 during a press conference at travel expo ITB Berlin. Al Baker announced a raft of forthcoming global destinations for the airline in line with its expedited expansion plans, including the announcement that Qatar Airways will be the first Gulf carrier to begin direct service to Luxembourg. Other new destinations to be launched by the airline include London Gatwick, Cardiff, Lisbon, Tallinn, Valletta, Cebu, Davao, Langkawi, Da Nang, Bodrum, Antalya, Hatay, Mykonos, Thessaloniki and Málaga. “Qatar Airways is tremendously excited to announce further expansion with a significant number of new destinations to be added to our extensive global network throughout 2018 and 2019,” said Al Baker. His Excellency also spoke passionately about the blockade against Qatar: “During the blockade Qatar Airways continued its expansion; it continued its march ahead. We kept our country supplied and we became prouder as a nation. Further developments for the upcoming year were also discussed, including additions to the airline’s sporting sponsorship portfolio. Qatar Airways is already the official sponsor of many top-level sporting events, including the 2018 FIFA World Cup Russia, the 2022 FIFA World Cup Qatar and the FIFA Club World Cup, reflecting the values of sports as a means of bringing people together, something at the core of the airline’s own brand message – Going Places Together.